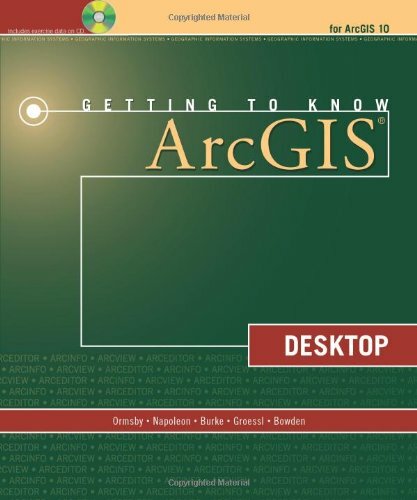 Getting to Know ArcGIS Desktop introduces principles of GIS as it teaches the mechanics of using ESRI’s leading technology. Key concepts are combined with detailed illustrations and step-by-step exercises to acquaint readers with the building blocks of ArcGIS® Desktop including ArcMap™, for displaying and querying maps, ArcCatalog™, for organizing geographic data, and ModelBuilder™, for diagramming and processing solutions to complex spatial analysis problems. Its broad scope, simple style, and practical orientation make this book an ideal classroom text and an excellent resource for those learning GIS on their own. A data CD for working through the exercises and a fully functioning 180-day trial ArcGIS® Desktop 10 software is included.